Formerly the attic, the miller's family used this space for storage (nothing ever was thrown away). This space has been converted into a warm and sunny hideaway. Five windows placed into the sloping roof allow in sunlight by day and moonlight at night. 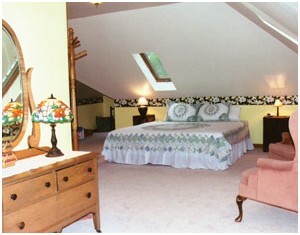 There are two alcoves/gables that are filled with pillows and children's furniture. The area includes a full bath with an adjoining changing room. 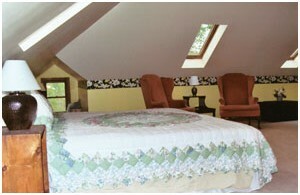 The Magnolia Room has a king-size bed and a twin-size bed with twin-size trundle; a twin-size roll-away also is available. A sitting area has two wing-back chairs; relax and enjoy the many videos and books that are available to all guests of Stratton House Inn. To get to the Magnolia Room you climb the original steep, attic stairs. This stairwell is protected at the top by a gate and at the bottom by a door. This area will comfortably sleep a family of five or several friends.